It’s a fact that everything happens for a reason. It’s also a fact that things rarely go as planned. Put the two together, and you pretty much have the majority of classic truck projects ever built! Todd Emmons’ 1974 Chevy C10 is no exception. As with many, if not most, projects, Todd’s Arizonian “square box” started out initially as his daily driver. At the time, he was in the middle of building a 1961 Studebaker Champion pickup. The ’74, an original Arizona truck, had a transplanted 454 and a bad paint job. But thanks to a nosey homeowner’s association (let’s just say they don’t care much for “shade tree” mechanics! ), his Studebaker had to be sold and the attention re-focused on the Chevy. In late 2000, Emmons had sent the C-10 off for a new paint job in nearby Tempe. Six months later, that shop closed down. To Todd’s relief, ex-manager Mike DeFrates had promised to take the truck with him and get it finished. Four shops later, and even a few stints at Mike’s house, the truck was still without paint. Through all of this, Mike and Todd actually became friends and through all the headaches, decided to take on and finish the truck together. After the meeting of the minds, the two agreed upon scrapping the idea of a simple paint job, opting to tackle a full frame-off instead. And once all the dust had settled from the idea hashing session, an “SS454” theme was the new name of the game—something Todd wanted to do in order to show what Chevrolet might have done in 1974. What that resulted in is a very unique approach to truck building—a “classic sport truck,” if you will. 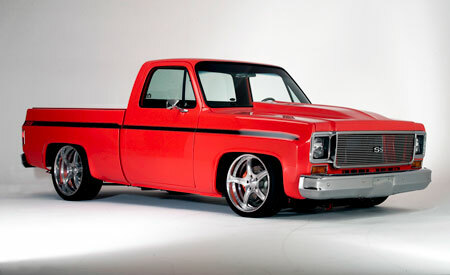 Even better, a “muscletruck!” Todd’s ’74 is anything but restored, but it’s about as far from being a full custom too. Todd and Mike’s theme was executed perfectly, from the Goodmark cowl-induction hood to the subtle yet striking SS side graphics to the black and orange houndstooth upholstery. If GM had produced a muscletruck 30 years ago, it sure as heck would have looked like this! Finally, before making its 2004 SEMA Show debut (a year later than the original anticipated debut), Emmons swapped out an already fresh interior for the aforementioned Camaro R/S-influenced threads. With the help of RodDoors, Todd installed new door panels and bench seat (which is now available in kit form from RodDoors), covered in a combo of black UltraLeather and OE orange/black houndstooth. The factory dash was re-equipped with Stewart Warner gauges (wired by Emmons with a Painless kit—his first attempt at wiring) with a Custom AutoSound stereo replacing the factory AM/FM unit. Rounding out the new interior are a B&M Mega truck shifter, Boyds steering wheel, Hot Rod Air A/C, and Electric Life power windows. Though concealed beneath the tonneau, it’s interesting to note that Todd used a Show Deck from Bruce Horkey for the bed floor—not just that he used it, but why. Turns out, after having the stock steel bed floor all finished, it soon became victim to an exploding driveshaft while on the Hot Rod Power Tour! Not wanting to spend the time to repair/replace the ribbed steel, Emmons opted for the wood floor instead, which he finished with an ebony stain (heavily clearcoated by DeFrates). To date, it’s one of the truck’s most popular items! Copyright © 2006 Classic Trucks, a PRIMEDIA publication. All rights reserved.